Sometimes you just need a mental health day. But, due to work, uni, college, or whatever you have to do that day it's not always as easy. Thankfully, more people are becoming aware of the fact that mental health is health, and it can do much more harm than good to just 'keep calm and carry on'. 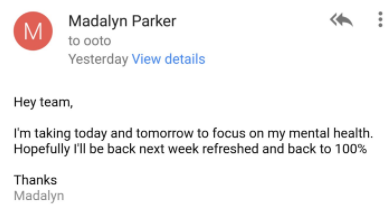 Twitter user Madalyn Parker recently shared an email exchange between her and her boss that restored our faith in humanity more than a little bit. 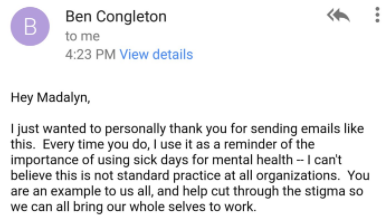 She emailed her team to say that she wasn't feeling great and needed to take some time out. This was the CEO's reply. It's a refreshing reply, and clearly struck a chord with a number of people who wish they had such sympathetic managers. I love your bunny and that your CEO supports you & understands. Its amazing. Hope your time of clarity helps you feel more like yourself! Unfortunately some weren't as lucky. As time goes on, hopefully it won't be such a surprise for someone to act so compassionately in the workplace and, as Madalyn's boss said, we'll be able to 'bring our whole selves to work'.